Home / asus / cherry mobile / digital / lenovo / nokia / oppo / smartphone / speaker / teqube / TeQube Store: Now open to respond digital needs. TeQube Store: Now open to respond digital needs. Teqube, a subsidiary of the TAO Group of Companies, continue's to find ways to reach consumers and present offerings to answer their digital requirements. Housing leading smartphone brands like Lenovo, Nokia, LG, and even offers gadget accessories, Teqube recently launched the its concept store and the first gadget store in the country that offers devices and accessories based on consumers’ lifestyle. Located at the 3rd Floor of Arcadia Building, Paseo de Sta. Rosa, Sta. Rosa, Laguna, this new addition is designed to be fun and welcoming. They can ask Teqube’s friendly gadget consultants to check out live units and devices that they can enjoy. As part of its opening celebration, Teqube will be raffling off 10 Teqube Bluetooth speakers work P1,200 for 10 consecutive days starting on November 13, 2015. Just visit the store to join. For those who are purchasing a minimum of P7,000, a Lenovo A269i Smartphone is up for grabs for only P20.00. This offer is open to the first 20 customers of Teqube from November 13 to 15, 2015 only. “Our new store in Laguna brings to life our mission of delivering the following to our customers: innovation, quality, and customer experience. Just like in any of our stores, we have our customers’ needs in mind when the store was conceptualized. We want to have a hub for them to fully experience the products and experience the lifestyle fit to their needs,” shares Angela Gutierrez, Business Head for Tao Tech Retail. Divided into different modules, the concept store captures the lifestyle of today’s consumers. The Power Play fits those who are looking for products that provide performance that they can rely on wherever they go. Huawei Y3c, Lenovo A328, Samsung J1, LG Leon, Microsoft Lumia 535 are featured in this section. For those who are looking for the perfect companion for the music loving Filipinos, they may check out the Sound Vibe module. This is where they can find Lenovo A319, Lenovo A7000, OPPO Mirror 5, Sony C4, and LG Magna. Lenovo Phab Plus, Lenovo A5000, Lenovo P70, LG G4, and Oppo R7 Lite are featured in the Game On module. This is the venue for the top-of-the-line gadgets to get consumers’ senses in high gear. The new store has a free Wi-Fi and also offers a gadget on demand service, which means, if it’s not in their store, Teqube will purchase it for you. For those who are spending P15,000, they can check the units at the unboxing area so they can have a better appreciation before they purchase. As part of its opening celebration, Teqube will be raffling off 10 Teqube Bluetooth speakers work P1,200 for 10 consecutive days starting on November 13, 2015. Just visit the store to join. 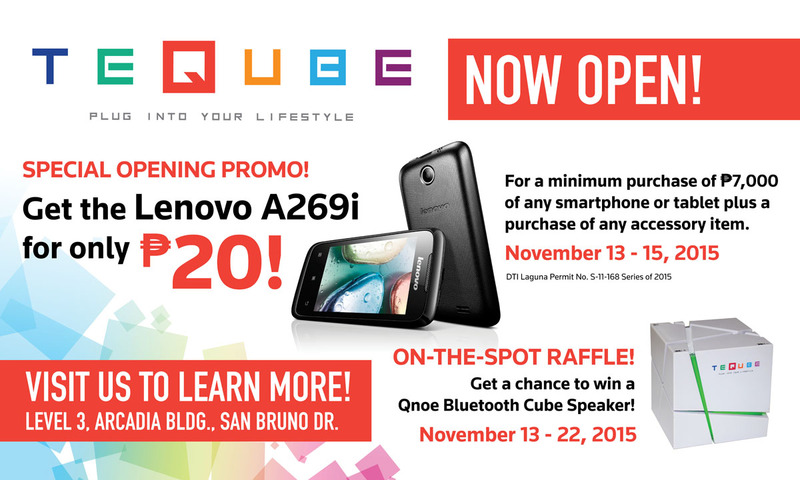 For those who are purchasing a minimum of P7,000, a Lenovo A269i Smartphone is up for grabs for only P20.00. Hurry because this offer is open to the first 20 customers of Teqube from November 13 to 15, 2015 only.